I was working at my computer last night when suddenly everything around me went dark and quiet. No warning. No explanation. Not even a storm to justify the outage. In years past, I was not as bothered as I am now by temporary losses of electricity. I used to experience them an opportunity to become quiet and reflect, to have a chat or play a musical instrument. I no longer am able to maintain such a casual outlook. In fact, though I am loath to admit it, I feel afraid when the power goes off without explanation. A most disturbing thought enters my mind: is this The Big One? In the last couple of years, the state of our nation and the world has heightened my concerns. Always such things were possibilities. It is only more recently that they have started to feel like probabilities. Some opposing nation, some terrorist group, hacking into our power grid and reducing us to helplessness in a second. We cannot deny the possibility, though denying it is what helps us move through daily life with relative calm. Even when acknowledging the possibility intellectually, it is still rather easy, when everything is working, to minimize the impact such an outage would have. But I remember, just 15 years ago this month, the great blackout of 2003. Much of the Eastern seaboard lost electricity, most of us for about 2 days. Between Canada and the United States, 55 million people were affected. Those of us who worked in buildings without windows that opened could not work. The heat quickly became stifling without air conditioning or even fans. Even worse, by the second day, toilets were not flushing as this region relies on electricity to maintain its water supply. And this shutdown was unintentional, caused by a random software bug. And it only lasted two days. We were inconvenienced and we had to throw out a good bit of food. We were worried but we also had some assurance that all would be righted within days. We were very fortunate. We are very fortunate. If (or when) The Big One occurs, we will indeed be powerless – in more ways than one. I recently returned from my pilgrimage to California which always fills me with gratitude. The beauty of the earth and the love of friends combine to help me see God afresh. Adding to my journey this year was an extraordinary book that I read on the way there and back again: The Hiding Place, by Corrie Ten Boom. I had read quotes from this book and it is such a classic that I thought I had read it before. It did not take long for me to realize that I had not. I am not sure just why God led me to choose this book for my pilgrimage reading but I am so very grateful that He did. I have read many Holocaust stories and memoirs but I believe that this one moved me like no other. For those unfamiliar, the story relates how Corrie and her family, living in the Netherlands, experienced World War II. As deeply Christian people, when it became increasingly evident what was occurring, they could not refrain from acting. Hiding Jews and growing the Underground to save more people became the center of their lives, despite their own country being occupied and arrests occurring all around them. When it was their turn to be arrested, they were rendered powerless in every sense – or so it would seem. They were forced to stand for hours in terrible weather, deprived of food, clothing and the last shred of their human dignity. They had to live amidst stench and vermin and were forced to work even when very ill. They lived in the shadow of the chimney and they were not oblivious to the source of its smoke. Some survived. Some lost their lives. But what is most extraordinary is that, despite all of this, they never became completely powerless. Not only did they know that God was with them, but they actively sought opportunities to share the Gospel. Yet people gathered around them in secret, longing to learn and experience the power of the One who had died for them. His truth could not be silenced, even there, where darkness and evil appeared to have control of not only their bodies but their minds as well. Last evening, when it became apparent that the power outage was not going to be brief, I considered what to do. Neither my laptop nor my cell phone were charged up. I could always pray, I thought. It is not unusual for me to feel spiritually dull after a retreat or pilgrimage. Some of this may be due to travel fatigue, some to the natural ebb and flow of spiritual energy. The enemy knows how to make use of such vulnerabilities and these last few days were no exception. I was tired yesterday evening and did not feel much like praying. I could do a round on my prayer rope, I thought. Sometimes pushing myself in this way starts my spiritual engine more effectively than I expect. It was growing darker inside but the final glow of sunlight lingered outdoors. I saw some people taking walks. I could do that, I thought, considering the physical benefits more than the spiritual. I won’t go far. Putting on my walking shoes and locking the door, I headed out. Instinctively, I reached in my pocket for my prayer rope. I felt it there, familiar in my hand, but there was something else in my pocket that I did not recognize. As I began the Prayer*, I pulled out another thin strand of black cord. I wasn’t sure how it came to be in my pocket but there it was. As I began to walk, I tied a single little knot at one end of the cord as I said the Prayer. And then another. And still more, one after the other. I sauntered up the street slowly, undoubtedly a strange sight, tying knot after knot while the Prayer hummed on in my heart. Since it was getting quite dark, I returned home, still praying and knotting, wondering if the piece of cord would be long enough to include 33 knots. Not quite. But the engine had indeed gotten started, though I was still without electricity. I found the original bundle of black cord, cut off a longer piece and began again. A knot and the Prayer, a knot and the Prayer…until there were 33, one for each year of Jesus’ life on earth. I wanted a Cross for this little rope but did not have one. Ideas came and went from my mind but they had to wait; my heart which was lost in the Prayer. Lighting a candle, I picked up another prayer rope, this one composed of 100 wooden beads and a Cross from the Holy Land, and sat before my icons. The Prayer continued. As I moved through the beads without hurry, it was clear to me that God had “roped” me in. My fatigue and moodiness of earlier days had disappeared. The Prayer felt as automatic as breathing. And I had no desire for it to stop. Having completed the wooden rope, I found a little Cross and attached it to the tiny knotted rope. Now it felt complete. In the course of my work, I often hear people lamenting the fickle nature of their minds and moods. Though we do not generally expect ourselves to be able to direct the workings of our other bodily organs, when it comes to our brains, we expect control of ourselves. My thoughts, my feelings – how can I say they are truly mine if, in reality, they are the result of brain chemicals that shift capriciously? And, if they become out of control without the aid of manmade medications, who am I really? Am I no more than a cocktail of neurotransmitters over which I have no control? It is part of the disordered state of our souls that we link our identity, the nature of our being, with control of each and every nuance of thought and mood we experience. Some of this desire for control may stem from our sinful pride. If I truly had the power to control all of these variables, everything would go so much better for me and the world around me. But our confusion has another level, just as deep as the first. We have been taught that God gave us free will. Does this not suggest that we should be able to control what we think and feel and do? After all, if we cannot control these things, how can we be considered “free”? How can God judge me at the end of time for how I’ve lived my life if, in reality, I was subject to the whims of genes and early environment? I am free to choose God. I was as powerless to think my way out of my malaise yesterday evening as I was to make the lights go on. I was in darkness and my own strength could not save me. I could not make myself feel happy, energetic or spiritual. But I still had a choice before me: given this state of affairs, what am I going to do? Apart from my human desires, befuddled as they can be by so many biological and environmental factors, there is in me (and all of us) a totally different type of desire – a holy desire. The desire for God is like a seed that God planted in me at conception. Over many years, my parents cultivated its growth, preparing me for the choice to take over this effort. Regardless of how I feel, regardless of what happens in the world around me, because of this seed, I can choose how I respond. Last night, I could make my hand reach for my rope, even in the absence of emotional or spiritual inclination. I could tie a knot and push my way through the words of the Prayer. I could wait and hope and trust that the engine would start so that, once again, I could be free of my inner paralysis. This was a very small “yes” my will said to God. So small that it hardly seems worth mentioning, especially when viewed alongside the many heroic yeses of the Ten Boom family. How is it that such feeble desire could produce any spiritual movement at all? It is in this awareness that I can embrace my powerlessness – for I cannot help but see that God was waiting for this little “yes” from me so that He could shower me with all of the grace I needed in my moment of dullness. It is not power that I need but an open and willing heart. * “The Prayer”, as used here, refers to the Jesus Prayer, “Lord Jesus Christ, Son of God, have mercy on me a sinner” (or more simply, “Lord Jesus Christ, have mercy on me”). This entry was posted in Uncategorized on August 12, 2018 by mary. For those of you who have read The Way of the Pilgrim, or are familiar with origins and practice of the the Jesus Prayer ” “Lord Jesus Christ, have mercy on me, sinner,” you know what an Orthodox Prayer Rope is. Each knot is tied with a prayer. Small prayer ropes, usually have 33 knots. There are also the bigger ones, with 50, 100, or 300 knots. 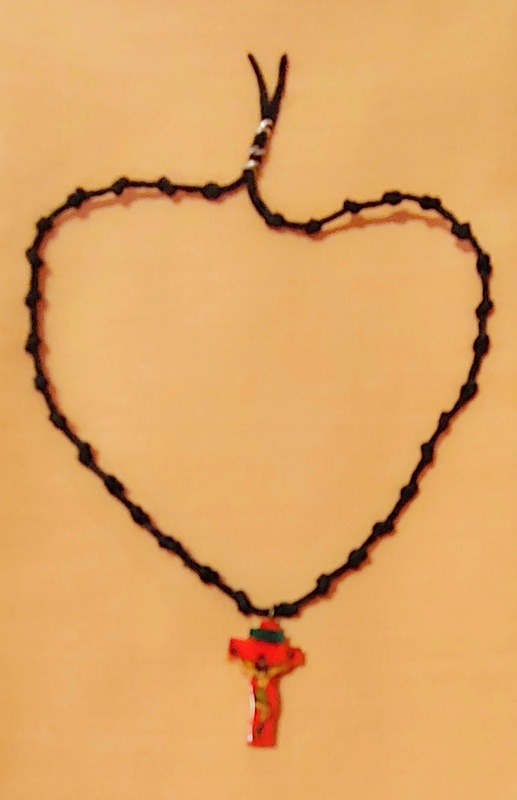 According to an ancient tradition, St. Pachomious wanted to make a wool prayer rope in order to count his prayers. Unfortunately, he was unable to finish it because the Devil would come and untie the knots. One day, an angel of God appeared to him with instructions on how to make the knots with seven crosses entwined in each knot. That was one of the most complicated ropes, which the Devil was not able to untie. The angel recommended the use of the Jesus Prayer on a knotted cord of one hundred knots. These prayers help us to gather our thoughts, and to keep our minds from wandering around. First, gather and clear all the thoughts in your mind, and then, take the knot of your prayer rope into your left hand, holding it slightly in between the thumb and the index finger. Then, make a sign of the cross with your right hand and quietly begin your prayer, counting every prayer with a knot. The Jesus prayer is the most important prayer in the life of every Orthodox Christian. Thanks, Jacksson for providing my readers with this additional history and instruction. I have watching videos on the official manner of knot-tying and decided that it was too difficult for me to learn without personal instruction – and maybe even then. So my little ropes are hybrids, which is perhaps appropriate for me as a Catholic. Thankfully,, though occasionally they have needed repair or replacement, no one has tried to untie the knots. May we all have an open and willing heart. I like the hybrid approach to the ropes but also to prayer itself, where power is, as you said, and where there are not necessarily any knots for someone who likes to untie things, and no rope for the person, or passion, to try to tie me in knots with. Quite seriously, anytime I am unwilling to interrupt my prayer for another, I must question whether I am truly praying or just putting on a holiness show (for myself or others). How can I claim to love and be in communion with the God I do not see but have no time for my neighbor who is right before me? Of course, I have been guilty of that very sin, more times than I would like to admit. But you have my permission to shake me and correct me if you see me committing it. And, someday, I pray that my heart will learn to continue its prayer even when my attention is required by matters of this world. My question was a weak, and maybe unholy, attempt at humor. But your answer was very nice, then helpful. As was the post itself. Thank you. -Peaked interest(s), alert awareness, & an enticing hunger for my/our faith. —Current thoughts that are renewing my thought processes that I know will blossom with spiritual prosperity; prospering spirituality. Thank you for sharing & Praise be to God. Our Ever Loving & Glorious Savior!